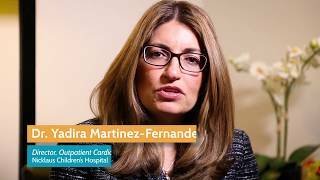 The Pediatric Cardiac Catheterization and Interventional Program at Nicklaus Children's Hospital, is widely recognized as one of the world’s leaders in interventional cardiac catheterization. By utilizing the latest innovations in imaging technologies, coupled with the newest catheter and device technologies, the cardiologists at The Heart Program are able to routinely perform both simple and complex interventional cardiac catheterization procedures that serve to enhance or, in certain cases, eliminate the need for open-heart surgery. While the catheterization laboratory is a high-tech environment, the program philosophy of high-tech meets high-touch is evident in every aspect of care. Families learn about their child’s heart catheterization procedure in a special pre-catheterization clinic and are encouraged to remain with their child in the cath lab until he or she is comfortably asleep. Blood work is completed while children are sleeping, in keeping with the hospital’s emphasis on minimizing stress. This family focused approach to care has contributed to the program’s international reputation and prominence.